With most of the action happening on the western part of the island, I would suggest for a shorter trip (~5ish days) it’s best to stay closer to rather than further to avoid a ton of driving time. I’ve stayed in various areas now and have narrowed down my favorites for different reasons! Platis Gialos — My favorite! This particular beach is nestled in the SW area of the island. You’re right in between two of the best beach clubs/restaurants in Mykonos: Nammos and Scorpios. In addition to a short bus/taxi ride to the airport you’re super well situated to Mykonos town or the beach discotecas (Cavo Paradiso and Super Paradise). Agios Stefanos — A little far removed from the heat of it all, but a very lush area with gorgeous beaches and villas. The best option if going in a large group and want ample space! Some of the best mediterranean food I’ve eaten to date has been on this island! There are a ton of legendary places that you've prooobably seen on Instagram, but a couple (now not so) secret faves. Sea Satin — Traditional Greek food on a whole other level. Get a late reservation… once the clock strikes midnight everyone hops on the tables flinging napkins and smashing plates to dance the night away. Nammos — Celebrating it's 15th summer on the island, Nammos is a Mykonos classic. We opted to get there before opening hour for a shop around the village, then proceeded straight to our sunbeds (make a res!!) until lunch hour. Everything we ordered was absolutely delish, with the poulet and octopus being the biggest hits at our table! The real party begins around half past 3 when everyone dances on tables under champagne showers. Scorpios — Similar concept to Nammos (beach club x restaurant), Scorpios is Nammos' cooler older cousin. Get a late lunch res, and stick around with a bottle or two to watch the sun go down. The food is exceptionally amazing here -- some items of note are: the fava (order with roasted tomatoes which are off menu), grilled vegetables and the souvlaki platter. Their wine selection is top notch with a few incredible whites from the region. Scorpios is a true nirvana when everything turns up at dusk. A day here is my #1 rec to anyone visiting Mykonos! 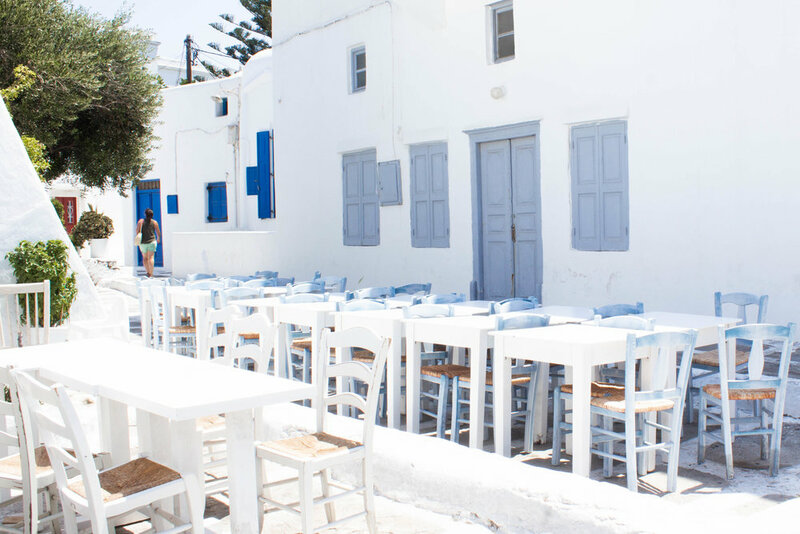 Kastro’s — A little bar and restaurant located on one of Mykonos' most idyllic alleys just off Little Venice. It's been running hot since '76 and is a local hotspot not to be missed! Spilia — Carved out on a cliffside, Spilia is sight for sore eyes. Perched on what seems like the edge of the world with the most amazing food, views, and people... you'll be here with a glass of rosé listening to the DJ's beats until the sun goes down. A true Mykonos icon. Mykonos town has the most darling little boutiques to find everything from handmade linen caftans to the most gorgeous evil eye jewelry. Head to Tria Pigadia in town for everything from Missoni to Chopard. The newly opened Nammos Village next to the beach club has all the greats… Dior, Gucci, Eres, and Vilebrequin including a Sisely spa! While Mykonos definitely holds true to it's party island reputation, there is something for everyone. Whether it's spending the day strolling the alleys of Mykonos town, catching the sunrise after a night at the disco or sailing the Greek blue waters... here are my favorite things to do on the blue island! Charter a boat around the island · explore Mykonos town/Little Venice · rent ATVs and scoot around the island · snorkle the little bays of Elia and Kalafati · beach day @ Nammos/Scorpios/Alemagou/Principote Panormos · sleep in and spend the whole day catching rays at Platis Gialos, Psarrou or Kalafati! Mykonos has become one of my favorite islands to summer on. There's an inexplicable feelign of μαγεία (greek for 'hint of magic') that wafts through the windy island.